Working with a start-up through their near-death experiences to their breakthrough moments is a drug. There is simply nothing better than it in life. To see the ingenuity of people working to change the world for the better is the most addictive thing on the planet. You never get over it, and you never get enough of it. But don't think that you get pats on the back for what you do. It's not as if the world necessarily appreciates the entrepreneur. People get jealous. They don't understand how decisive you have to be. You don't have the luxury of holidays; you simply answer the phone in another location. Innovators get into trouble. Caravaggio was one of the greatest painters of all time. He painted the world as it was, not pretty. He was trouble, and that got him into trouble. Misfortune befalls innovators because as Machiavelli says above, they are bringing about a new order of things. The status quo has teeth. Don't be an entrepreneur because you think it's cool. It's actually not. Or you don't want to work for someone else. You work for everyone. Be an entrepreneur if you honestly will not be ok if you don't do what you take to market. Entrepreneurs are people who are literally NOT QUITE RIGHT in the head. Does anyone really think that Steve Jobs, or Elon Musk, or Larry Elison are 'nice' people. I highly doubt they are. They have created great businesses, and while they don't get a free pass for their foibles, they move the world forward – solving problems from which all of society benefits. Big, rich and paranoid, they have reams of data to help them spot and buy young firms that might challenge them. The behemoths’ annual conferences, held to announce new tools, features, and acquisitions, always “send shock waves of fear through entrepreneurs”, says Mike Driscoll, a partner at Data Collective, an investment firm. “Venture capitalists attend to see which of their companies are going to get killed next.” But anxiety about the tech giants on the part of startups and their investors goes much deeper than such events. Venture capitalists, such as Albert Wenger of Union Square Ventures, who was an early investor in Twitter, now talk of a “kill-zone” around the giants. Once a young firm enters, it can be extremely difficult to survive. Tech giants try to squash startups by copying them, or they pay to scoop them up early to eliminate a threat. 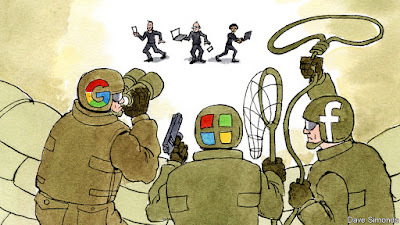 The idea of a kill-zone may bring to mind Microsoft’s long reign in the 1990s, as it embraced a strategy of “embrace, extend and extinguish” and tried to intimidate startups from entering its domain. But entrepreneurs’ and venture capitalists’ concerns are striking because for a long while afterwards, startups had free rein. In 2014 The Economist likened the proliferation of startups to the Cambrian explosion: software made running a startup cheaper than ever and opportunities seemed abundant. Today, less so. Anything having to do with the consumer internet is perceived as dangerous, because of the dominance of Amazon, Facebook and Google (owned by Alphabet). Venture capitalists are wary of backing startups in online search, social media, mobile and e-commerce. It has become harder for startups to secure a first financing round. According to Pitchbook, a research company, in 2017 the number of these rounds were down by around 22% from 2012. The wariness comes from seeing what happens to startups when they enter the kill-zone, either deliberately or accidentally. Snap is the most prominent example; after Snap rebuffed Facebook’s attempts to buy the firm in 2013, for $3bn, Facebook cloned many of its successful features and has put a damper on its growth. A less known example is Life on Air, which launched Meerkat, a live video-streaming app, in 2015. It was obliterated when Twitter acquired and promoted a competing app, Periscope. Life on Air shut Meerkat down and launched a different app, called Houseparty, which offered group video chats. This briefly gained prominence, but was then copied by Facebook, seizing users and attention away from the startup. The kill-zone operates in business software (“enterprise” in the lingo) as well, with the shadows of Microsoft, Amazon and Alphabet looming large. Amazon’s cloud service, Amazon Web Services (AWS), has labelled many startups as “partners”, only to copy their functionality and offer them as a cheap or free service. A giant pushing into a startup’s territory, while controlling the platform that startup depends on for distribution, makes life tricky. For example, Elastic, a data-management firm, lost sales after AWS launched a competitor, Elasticsearch, in 2015. Even if giants do not copy startups outright, they can dent their prospects. Last year Amazon bought Whole Foods Market, a grocer, for $13.7bn. Blue Apron, a meal-delivery startup that was preparing to go public, was suddenly perceived as unappetising, as expectations mounted that Amazon would push into the space. This phenomenon is not limited to young firms: recently Facebook announced it was moving into online dating, causing the share price of Match Group, which went public in 2015, to plummet by 22% that day. It has never been easy to make it as a startup. Now the army of fearsome technology giants is larger, and operates in a wider range of areas, including online search, social media, digital advertising, virtual reality, messaging and communications, smartphones and home speakers, cloud computing, smart software, e-commerce and more. This makes it challenging for startups to find space to break through and avoid being stamped on. Today’s giants are “much more ruthless and introspective. … Startups used to be able to have several years’ head start working on something novel without the giants noticing, says Aaron Levie of Box, a cloud and file-sharing service that has avoided the kill-zone (it has a market value of around $3.8bn). But today startups can only get a six- to 12-month lead before incumbents quickly catch up, he says. There are some exceptions. Airbnb, Uber, Slack and other “unicorns” have faced down competition from incumbents. But they are few in number and many startups have learned to set their sights on more achievable aims. Entrepreneurs are “thinking much earlier about which consolidator is going to buy them”, says Larry Chu of Goodwin Procter, a law firm. The tech giants have been avid acquirers: Alphabet, Amazon, Apple, Facebook and Microsoft spent a combined $31.6bn on acquisitions in 2017. This has led some startups to be less ambitious. “Ninety per cent of the startups I see are built for sale, not for scale,” says Ajay Royan of Mithril Capital, which invests in tech. This can be enriching to founders, who can go on to start another firm or provide financing to peers with smart ideas. To the extent that such exits provide more capital to spur innovation, this is no bad thing. The tech giants can help the firms they acquire grow more than they might have been able to do on their own. For example, Facebook’s acquisition of Instagram took out a would-be competitor, but it has thrived under the social-networking giant’s sway by adopting the technical infrastructure, staff and know-how that Facebook had in place. Another source of market information comes from investing in startups, which helps tech firms gain insights into new markets and possible disrupters. Of all American tech firms, Alphabet has been the most active. Since 2013 it has spent $12.6bn investing in 308 startups. Startups generally feel excited about gaining expertise from such a successful firm, but some may rue the day they accepted funding, because of conflicts. Uber, for example, took money from one of Alphabet’s venture-capital funds, but soon found itself competing against the giant’s self-driving car unit, Waymo. Thumbtack, a marketplace for skilled workers, also accepted money from Alphabet, but then watched as the parent company rolled out a competing service, Google Home Services. Amazon and Apple invest less in startups, but they too have clashed with them. Amazon invested in a home intercom system, called Nucleus, and then rolled out a very similar product of its own last year. Recruiting is a second tool the giants will use to enforce their kill zones. Big tech firms are able to shell out huge sums to keep top performers and even average employees in their fold and make it uneconomical for their workers to consider joining startups. In 2017 Alphabet, Amazon, Apple, Facebook and Microsoft allocated a combined a whopping $23.7bn to stock-based compensation. Big companies’ hoarding of talent stops startups scaling quickly. According to Mike Volpi of Index Ventures, a venture-capital firm, startups in the firm’s portfolio are currently 10-20% behind in their hiring goals for the year. A third reason that startups may struggle to break through is that there is no sign of a new platform emerging which could disrupt the incumbents, even more than a decade after the rise of mobile. For example, the rise of mobile wounded Microsoft, which was dominant on personal computers, and gave power to both Facebook and Google, enabling them to capture more online ad dollars and attention. But there is no big new platform today. And the giants make it extremely expensive to get attention: Facebook, Google and Amazon all charge a hefty toll for new apps and services to get in front of consumers. Seeing little opportunity to compete with the tech giants on their own turf, investors and startups are going where they can spot an opening. The lack of an incumbent giant is one reason why there is so much investor enthusiasm for crypto-currencies and for synthetic biology today. But the giants are starting to pay more attention. There are rumours Facebook wants to buy Coinbase, a cryptocurrency firm. Regulators will be watching what the giants try next. Criticism that they have been too lax in approving deals where tech firms buy tiny competitors that could one day challenge them has been mounting. Facebook’s acquisition of Instagram and Google’s purchase of YouTube, before it was obvious how the pair might have taken on the giants, might well have been blocked today. To fight back against the kill-zone, regulators must closely consider what weapons to wield themselves. Being hungry means many things. It is ambition, resourcefulness, scrappiness, having a get-isht-done attitude, etc. It is very tied to humility as well, because it means realizing that no matter how many nice things people now say about us, we’re still 0.1% of the way towards what we could build. Hunger hates complacency. It is allergic to hubris. It is not the size of the market. It is not some giant dinosaur company waking up and actually getting a clue. It is us waking up and thinking our isht don’t stink. When you’re in tiny offices where a neighboring tenant poos on the floor in the bathroom (true story), or where you have office mice (also true), or where a $5K deal is the highlight of your month (also true), hunger is part of the DNA of the team. Only a certain type of masochist joins a company at that stage and enjoys it enough to stay. This is, of course, natural and expected to some extent. But insurgents have the advantages of speed and responsiveness to customers, and IMO maintaining hunger is key to these. So this is our other challenge. How do we maintain hunger even in the face of the modest perceived success we’ve had? If you know any good examples of companies that have maintained that hunger as they’ve scaled, would love to hear more. If any really good ideas or examples emerge from among the responses, we’ll roll them up and share back with everyone. Last week, I shared an earlier post titled 54 mistakes of a startup CEO that was written when CB Insights was under 25 people. That newsletter talked about some of the communication challenges that have cropped up as the result of our growth (we’re now nearly 200). The other challenge I talked about was maintaining culture, which I wanted to cover today. First, defining culture. We’ve defined the culture of CBI through the lens of the people we aim to have on the team. Most of the above are obvious. Happy is probably the one that requires some explaining. It doesn’t mean walking around all day with a smile on your face. It does mean an orientation towards solutions. A “yes, if…” mentality vs a “no, because…” disposition. It’s people who favor creation over criticism. When I worry about maintaining culture, however, the H that I worry about the most is hunger. Lo que no resolvamos bien en la ciudad, no lo resolveremos en los estados ni en el planeta. Las ciudades tienen un nivel de concentración de población, riqueza y problemas que las convierten en el espacio prioritario para la actuación de la política. Lo que no resolvamos bien en la ciudad, no lo resolveremos en los estados ni en el planeta. El problema es que son enanas políticamente hablando y su capacidad de actuación es limitada comparada con los retos con los que viven.